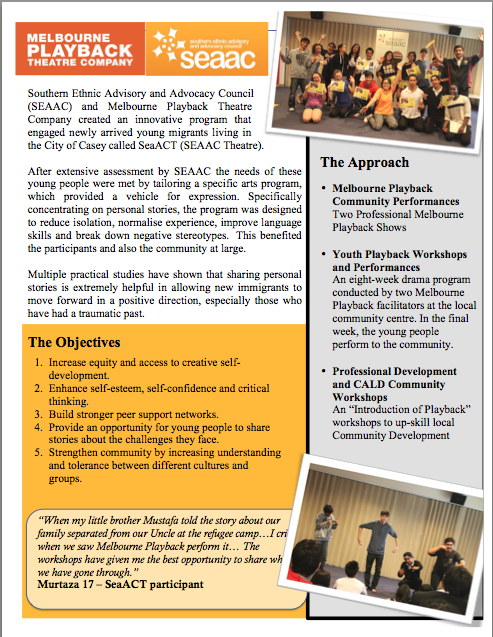 The SeaACT (SEAAC Theatre) program is partnership with Melbourne Playback Theatre Company and SEAAC Youth Services that engages young people living in the City of Casey and Greater Dandenong Council in an innovative Theatre Engagement Program. The program involves MPTC workshops within the two areas, including young people, community development workers from Council and service providers and CALD community groups. Mustafa, Hampton Park Secondary, 13 years old. The program was first envisioned in 2012, through consultation with SEAAC Youth Services who we have performed regular Refugee Week Celebration performances. In 2013 we received a pilot Arts Victoria grant (now Creative Victoria) to work with the City of Casey community, and create a theatre hub at the Hampton Park Uniting Church Community Centre. The program was a great success with other 120 young people registered, and we engaged with the Hampton Park community through the term workshops and performances. We had young people from Greater Dandenong travel 45 minutes to attend the program in Hampton Park. This showed us this program was a need for the young people living in the South Eastern Suburbs. 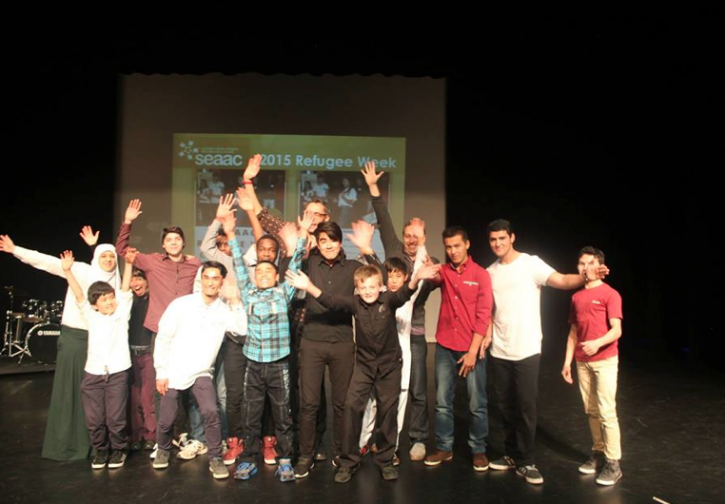 SeaACT young people performed in front of 500 people during the SEAAC Refugee Week Celebration in 2014. This included a performance in Greater Dandenong and council saw the value of the program and supported our Vic Arts application for 2015. During the 6 months of no funding by Creative Victoria, City of Casey had seen the impact of the program, and in Term 4 2014 funded for a small SeaACT program to continue. SEAAC engaged with students at a local school, and the participants performed in front of their peers. In November 2014, SeaACT program was re-funded by Creative Victoria to operate in the City of Casey, and pilot program in Greater Dandenong. The program has been a gem for the young people living in these isolated areas, as their stories are heard, shared and valued. Some of the young people attended a MPTC rehearsal on Mondays, and one young person recently performed at the Malthouse, through a referral from the SeaACT program. We endeavour to continue this program, and create a performing arts hub in the south eastern suburbs. 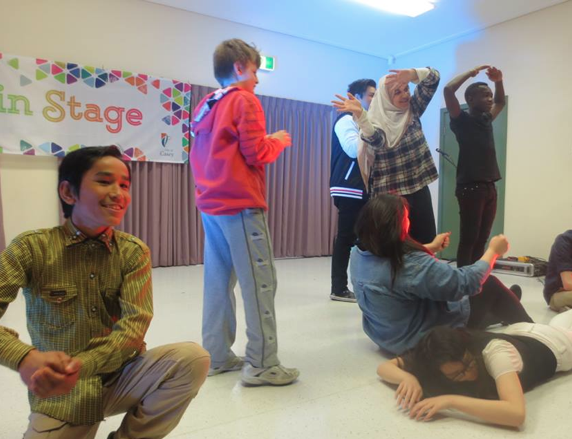 The SeaACT Drama Program provided young people with an opportunity to learn essential skills acting such as group acting, confidence building and improvising. 22 young people completed the evaluation form at the end of the program and provided extremely positive feedback about the program. Since starting with Melbourne Playback in November 2011, I have had many exciting moments as the Company Manager. Let’s start at the beginning; the 30th Birthday Celebration where, as the newest member of Melbourne Playback, I stood in the epicentre of a long spiral, surrounded by over 70 past members. I felt a rush of excitement and a sense of pride as I joined this inspirational group of people at such a milestone in the company’s history. Next, to Shepparaton for the company’s performance at Riverlinks Theatre on the theme of ‘Mystery’. In a hire van we travelled as a company to the gig and I just loved it but questioned my enthusiam in doing the schools mailout at the same time! The performance was just great and the moment of it all coming together was when Danny, who was conducting, asked the audience “Is there anything anyone would like to say?” A gentleman who had not spoken before said he felt warmed by the stories people told and he understood that we were not so different, that from each person’s story there was something he could relate to in his own life. He had the feeling of being connected. It was indeed a pleasant and honest evening! At the end of January Jonathan Fox and Jo Salas, co-founders of Playback Theatre, came and workshopped with the company. Such a fantastic opportunity to see the creators express their points of view and pass on their learnings which was enriching and enlightening. The moment here was when I told a story that Jo Salas conducted. I felt so special and I don’t know why exactly but I know I felt so in the moment, so alive, so seen and heard. The Melbourne Playback Theatre Company performers played back my story and from this I saw something about my self that I had not seen or understood before. I was blown away! And if I was not already sold on Playback Theatre as being transformative and insightful, this performance certainly sealed the deal! **This is something I recommend for every person to do in their lifetime – Have a story of yours played backed by Melbourne Playback Theatre Company. But beware – it is addictive. Everyone has many stories to be told. We recently performed for a corporate client in the financial sector. The team of about 30 staff were working with the founder of the Critical Management Group, Marc Stigter on a longer program designed to guide them through what Tuckman might call the ‘forming and storming’ stages of their development. We were brought in early on in this process to do two main things; to model high performance teamwork and to provide an opportunity for the group to reflect and share their ideas about the team. Our facilitator opened the invitation for stories simply by asking the participants to reflect on a time where they witnessed or were part of a high functioning team. We then heard stories from several members of the group. What struck me was a common theme that ran through each of the stories; the importance of strong personal relationships to teamwork. One story was of a high-functioning team from a previous workplace. The team was full of talented individuals and senior management decided to split them up in an attempt to pollinate the rest of the organisation with the ‘magic’. The woman who told the story reflected that management failed to realise the magic of this team was based on strong working relationships more than the talent of the individual team members. Another participant spoke about a strong friendship that she had built with a colleague and how that had enhanced her engagement and motivation at work. But perhaps the most surprising and powerful story shared as part of our performance was the one that hit most at the humanity and heart of us all. The man who shared the story had been managing a new team that was geographically spread across the country. Within a short space of time, coincidentally three members of the team were diagnosed with breast cancer. What followed was a very moving account of how the entire team came together to support the women. Despite the geographical distance, close personal relationships were formed and the group found a meaningful bond. Tragically, one of the three women lost her battle with cancer and the team found themselves grieving together for a friend and colleague. The work team had become a family. Significantly, the man told us, this challenging time was followed by a period of very high performance teamwork and staff turnover remained at zero for an unprecedented number of years. After this story had been shared and we had performed it back for the group, I could tell that something significant had occurred in the room. It was clear that the story had had an emotional impact on everyone and that the group had gained a new insight into one of their colleagues. This story and others shared within our performance had played a role in building trust and understanding within the team. It had also allowed the group to articulate something that they crave for the future of their own team; stronger personal relationships. In my time as a performer with Melbourne Playback, I’ve noticed how playback theatre has a knack for connecting people in this way and helping build relationships. When someone shares a story and the group is encouraged to listen and reflect on the story in a deeper way, a shared understanding is created. Through story we learn about each other. We reveal our values and identify what motivates each of us. I’ve seen friendships form between audience members at our public performances and between participants in our workshops. Similarly, the stories that we share as part of our rehearsal process help build a deeper understanding between our own ensemble members. I believe that the strong personal relationships developed through this process play a critical role in our own success as a team, both on the stage and behind the scenes. To help launch our new blog site, we thought we’d celebrate the memorable moments that have occurred in our performances and workshops! In over 25 years we have performed for thousands of people and heard many amazing stories. There are many moments that stand out for us because they made us laugh or cry or inspired us in some way. It might be the time Melbourne Playback visited your organisation or it might be a public performance you saw. It might be a particular story you heard someone tell, an image that the actors made, or a song that has stayed with you for some reason. It might even be something that occurred after a Melbourne Playback performance – a conversation inspired by a story you heard or a relationship that changed. Read about the moments that live on beyond our performances and share with us the memorable moments that you’ve had with Melbourne Playback Theatre!